After working up in the bird division on a painting of a Nicobar Island Pigeon, I went back downstairs into the collections to do a painting of some sort of ungulate. 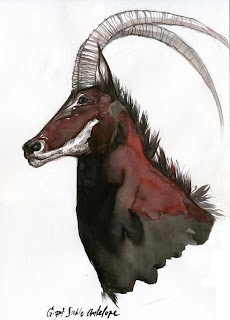 I chose the Giant Sable Antelope. These are massive forest dwelling antelopes of Angola, and a rare subspecies of the more common Sable Antelope. It was thought that they were extinct, and a casualty of the decades long Angolan civil war, until a herd was discovered in 2002. The Angolan people revere Giant Sables as mystical and powerful creatures, and their image graces Angola's airline, and stamps as a national symbol. I hope to have the time to do a painting of the entire animal. It's too big to fit in my sketchbook.